Mifflin County catcher Andrew Kanagy swings his glove to tag out Bellefonte’s Nick Catalano at home plate after a suicide squeeze bunt attempt Wednesday in Milroy. MILROY — Mifflin County American Legion coach Bernie Howard had preached for quite some time that his team’s No. 1 quality is resiliency. That proved to be true in the team’s final game of the Central Penn League regular season in which the team overcame a late no-hit bid and three costly errors in a 5-3 win over Bellefonte at Armagh Field Wednesday. Bandits pitcher Adam Armstrong turned out to be stellar in his five innings of work, no-hitting Post 287 before handing the ball over to Ashton Wetzler in relief. The pitching change proved to be exactly what Mifflin County needed as it put together a string of seven consecutive hitters reaching base to take the lead in its final at-bats. In his first at-bat of the contest, Drew Westover, who entered for starting pitcher Connor Yoder, kicked things off with one out in the home half of the sixth. Ross Underhill followed suit with a single of his own. Jared Hannon, pinch-running for Westover, and Underhill advanced on a ball that fooled catcher Eric Peggs, who had a tough go of things behind the plate late in the game. A few pitches later, just as Cade Attick was taking his base on a walk, the ball got past Peggs again, allowing Hannon to score Post 287’s first run of the game. Evan Mock then came through with a game-tying, two-run double to right-center field that scored both Westover from second and Attick from first. 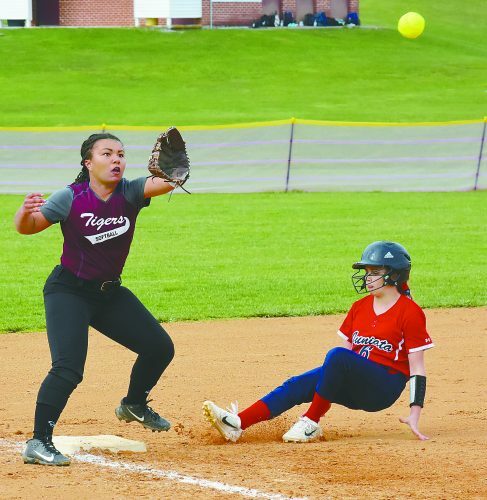 Sloppy pitching and great heads-up base running continued to be the theme in Mifflin County’s big five-run conclusion. With Mock on third after a wild pitch, Tyreen Smalley gave the club the lead for good on his first suicide bunt under the coaching of Howard. “Westover comes in and slaps that single to left field, it was like a spark, and we took it from there,” Howard said. “I knew we had hit around, but the thing I take is we were able to utitilize the small ball. We really wanted to put them on the defensive, and that’s exactly what happened. 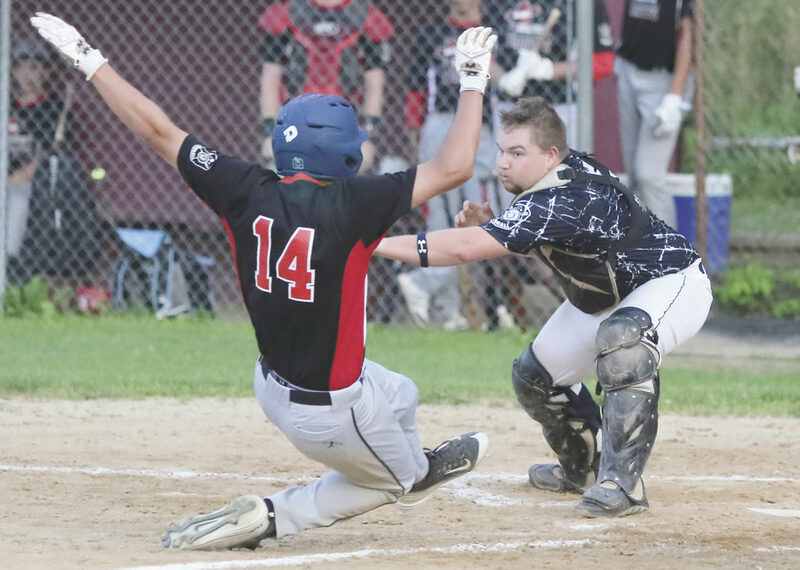 Andrew Larson was then hit by a pitch, and after a great approach Nick Hostetler — who fell behind 0-2 in the count and fouled off four pitches — managed to walk the bases loaded. Mifflin County scratched out an insurance run on a bases-loaded walk issued to Ty Bodtorf after Wetzler got Max Oburn to fly into a fielder’s choice. Westover then closed the door on the Bandits with a 1-2-3 inning, including a three-pitch strikeout to the Zane Thronburg to end the game. Prior to his Westover’s relief appearance, Post 287 starter Yoder had pitched well around blunders from the defense and of his own. He issued five walks, including a pair to begin the game and a pair to start the sixth before being taken out in the sixth. 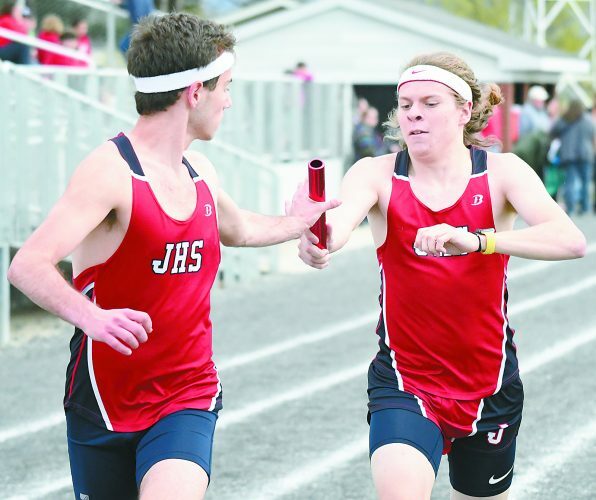 Of the three runs given up to Bellefonte, only one was earned. Bellefonte struck for the game’s first run with a two-out single from Ben McCartney to score Bandits’ leadoff hitter Dylan Deitrich. Then after three briskly paced innings, Bellefonte struck again for two more runs to take a 3-0 lead. The lead would have been up to four, but a great heads-up play by Yoder got Nick Cotalano out at the plate on a Cade Fortney suicide squeeze attempt. Yoder wound up throwing 65 pitches over the course of five innings. He allowed three hits. Post 287’s defense calmed down as the game progressed. Just as Westover came in he needed three pitches to get three outs. Aaron Kanagy threw out McCartney at second base, and one pitch later, Westover got Mason Grey to line out to Oburn at third. He caught a runner taking off at first for the inning-ending double play. Westover also picked off Gunner Fravel at first base for the second-to-last out of the game. After playing 16 straight games away from its usual home field, Mifflin County (19-6) will play host to either Clarence or State College in the opening round of the league tournament. Howard expects to the team to be ready, especially after what he saw from the team Wednesday night. The CPL first-round game will be at 6 p.m. Friday at Mifflin County High School.